You can now taste various local specialty seafoods and experience fishing on the beautiful Chuja Islands. 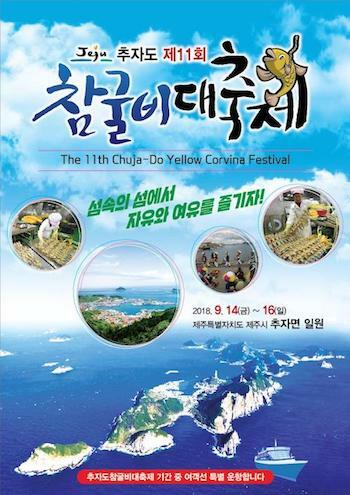 The 11th Chuja-Do Yellow Corvina Festival will be held from Sep.14 to 16 in Chuja Islands. The opening ceremony will be held at 7 p.m. on the 15th. The festival offers a variety of culture experience events such as fishing boat parades, dried yellow corvina picking show, seafood barbeque event, fishing events, and family fishing contest. During the festival, besides the regular passenger ship, the Queen Star (passenger ship) will operate two additional times on the 14th and 16th and three additional times on 15th.